web and software design for non-profits. This year we have result from two versions of our simulator! Based on 1,000 simulations run on tXtFL 2.0.0, completed by February 5, 2010, 11:31AM PST. 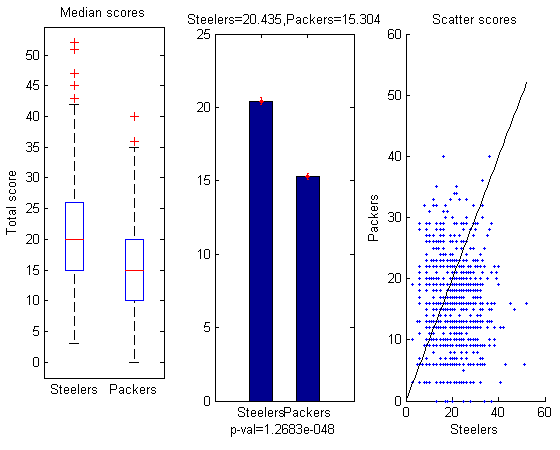 The Steelers are predicted to edge the Packers by less than a TD, 20-15, with paired t-test p < 0.001, standard deviation = 10.5, CI = [ 4.5, 5.8 ]. Based on 100,000 simulations run on tXtFL 3pre (build 2011-01-30), completed by February 5, 2010, 11:31AM PST. 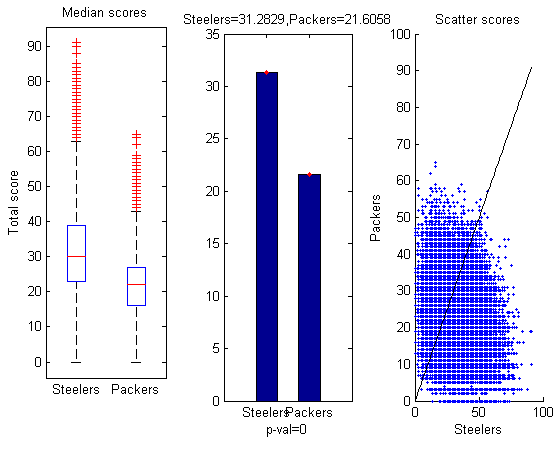 The Steelers are predicted to beat the Packers by less than 2 scores, 31-22, with paired t-test p < 0.001, standard deviation = 15.8, CI = [ 9.6, 9.8 ]. The stable and developmental versions of tXtFL agree that the Steelers are the statistical winners, but only time will tell if Ben Roethlisberger and his crew will live up to expections, or if Aaron Rodgers and the Packers will upset the delicate statistical balance. Both tXtFL 2 and tXtFL 3 came up short, predicting the Steelers would win when the Packers won instead. While tXtFL 3 didn't get the winner correct, the predicted scores are a flipped version of the real scores (note the 31 point bars). Intriguingly, tXtFL 3 came close to Madden NFL 11, which also picked the wrong winner. Our conclusion is that while the Steelers were statistically dominant, intangible factors in the form of Rodgers and the Packers package changed the game. As a side note, tXtFL 3 (pre-release, as of Feb. 19, 2011) has made leaps and bounds over tXtFL 2 in speed tests. The gauges show number of games per second for each version. Copyright © 2002-11, Text Flex. | Official stuff. | Contact us.